To say I am a fan of this series would be an understatement. I have long held them as perhaps my favorite romances of all time (though a few things like the works of Wong Kar Wai and classics like Casablanca occasionally raise their head in contention, but whatever. There’s room to love them all) and consider them the crowning achievement of Linklater, which is no light feat considering this is the man who made Dazed and Confused, Tape, A Scanner Darkly, Bernie, and many other films of fine quality. He also made the Bad News Bears remake but lets not speak of such things. What I’m trying to say is that I like Before Sunrise and Before Sunset a lot. A damn lot. A double damn lot. So when this film was announced, I was anxious for multiple reasons. 1) Could they recapture the magic that made the first two so… magical? 2)Did I want to see past the perfect ending of Before Sunset? 3)Why did Linklater and Hawke lie to me at the QandA I’d attended where just two months before it was announced that this film was FINISHED, they had claimed to only be tinkering with the writing process. Pure betrayal. 3) Because they’re magnificent bastards and I must forgive them. The series, reflecting even in the title, has always been obsessed with the ephemeral nature of relationships. 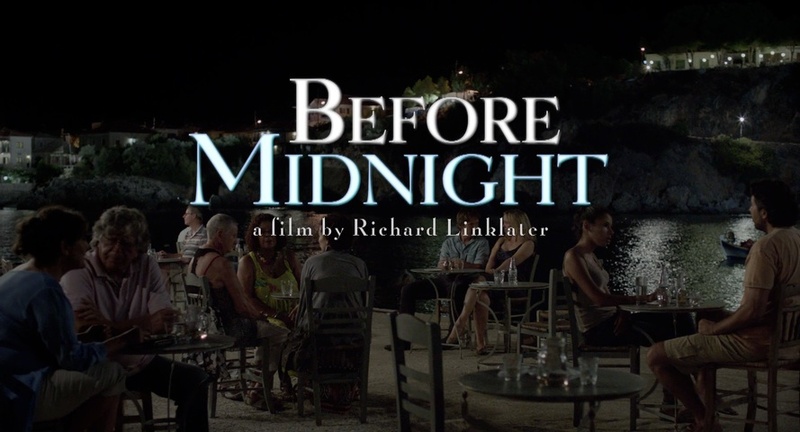 The first two capture and reflect on those fleeting life defining moments and Linklater’s proclivity towards dialogue imbued it with a natural and reflective quality that made it feel like every word, no matter how inconsequential the conversation, mattered because these are the moments that change and make us who we are. This film is even more direct in its appraisal of our impermanence as we step into their lives nearly a decade since we left them. Like the second, we find ourselves gradually unraveling who these people are and how their lives have changed (some ways small, others massive). I do not want to delve too far in the plot as a means to avoid spoilers, but the title is definitely an indication of a “darker” more mature tone than the previous films. Because of this, it is likely the most ambitious both structurally and thematically. It directly challenges the notions of fans (and the protagonists alike) in regards to a sustainable love, whether love matters, and the trans-formative nature of time. One of the things I find so refreshing in this series is how nothing feels stagnant. We may only be with them for one day every decade or so, but life does not stop. The family drama aspect, new to this series but fully realized, feels so far removed from the wide eyed optimistic kids that we can feel the years drip through every inch of the film. Due to this, it is of no surprise that the films location has been changed Greece. Ruins surround them, they dine with friends in a beautiful villa surrounded by lovers in different stages of life, an overtly modern hotel juxtaposes and gives setting to the starkest conflict within the film. Greece embodies the dynamic themes of the film and mirrors their relationship so hauntingly well that it almost makes me believe that as soon as they decided on this location, the film wrote itself. It is in a state of chaos, it carries within a history that is rich, yet erroded by time, yet even with all this, it carries such immense beauty one can be moved by merely opening their eyes. The dialogue in it is still top notch. Rarely has a film so talky felt so seamless with its characters. What I mean by that is there is no feeling of puppetry, where multiple characters are speaking from the same voice, a pitfall of even the most talented writers. Due to this, it is of no surprise that Hawke and Delpy both co-wrote with Linklater. They simply ARE Jesse and Celine. This was a very personal experience for me. I watched this movie with my girlfriend sitting beside me. It was our fourth year anniversary and while we are still very much in love, we’ve had some rocky patches lately. I showed her the first two on our first anniversary and the series became one of our shared favorites. We’ve changed a lot in the previous three years and not always by choice. In many ways, despite us being substantially younger than Jesse and Celine, the film would strike a chord of authenticity (and not always on the happy parts) that throttled us. There were moments of inexplicable emotion that came over me and at their most intense, they were almost overwhelming. We walked out nearly silent. We joked around bit about how they fight like we fight and joke like we joke. It is rare that both of us are impacted as strongly by a film in the same way. The closest film, albeit in a very different way, to grab me so strongly was Michael Haneke’s “Amour”, largely due to my going through a similar experience with my grandfather. Rather than destroying me emotionally, like the latter, this film made me contemplative and, to risk being even cornier than before, more grateful for the relationship I’ve had. I’m sure that this is not unique to me and that is the point I’m trying to make (sorry if that personal bit bored you but I don’t care, you’re in my thread, damn it! Thank you though, if you’ve read this far… Damn it!). The sheer power that these films and,in particular, this film have is the ability to feel so personal so many. Linklater, Hawke, and Delpy have managed to weave a cinematic world so real, complex, and relatable that it demands that you feel for these characters as if their lives are your own. Many of the greatest films I’ve seen have been reflections of the world the auteur lives in and few have ever reached a clarity or honesty that these films have. So, is it better than the other two? I want to say yes, though part of me longs for the hopeful note the second ends on (that is not to say this one ends on a pessimistic note though) but this one confronts the drama of real life with a fearlessness that the others felt like they were running or trying to be saved from. When we arrived in the screening, we were the only people as we got there early so we could get the seats of our choosing. So what happens 5 minutes before it starts? Two groups of old people come and sit right behind us. The first group was an old couple with an old man who was hard of hearing and needed everything explained to him. The other was a group of old women that had to give their opinion on EVERYTHING. So with a viewing like that in mind, believe me when I say I LOVED this movie.